The election is upon us, promises are being made and much greenwashing is being done. We are hoping that you will help us bring out some of the real issues, get real commitments and do it all with a little fun and humour. So I want to help save the planet. What can I do? a. Will you sign a pledge to stop new approvals on the tar sands operations? b. Given the fact that people in Fort Chipewyan are being diagnosed and in some cases dying of rare forms of cancer and other auto-immune disorders and given that at least one independent water study has found high concentrations of carcinogens in the water why hasn’t a full public inquiry been launched to determine the reasons for these abnormally high clusters believed to be linked to tar sands operations? c. Given everything we know about global warming how can we in good conscience continue the development of the Alberta tar sands that by 2020 will emit more greenhouse gases than all the cars and trucks currently in Canada doubled(over 141 million tones)? d. Do you have a plan that will actually decrease emissions by 2020? e. Do you consider the Energy Utilities Board approving over 97% of the over 60,000 project proposals it saw last year operating in the public interest? Elections are also one of those times where candidates like to make grandiose promises in hopes of getting elected. While you are at the forum why not put all the politicians on the spot and try to get them to sign a giant pledge. A version of the pledge is in the resource section of this document. You can also get a pdf version by emailing Mike at mhudema@greenpeace.org. Simply blow-up the pledge, take it to your forum, stand at the microphone and challenge all of the candidates to sign their name. If you are really brave why not turn up the heat and put it all on film. You should then submit it to Mike at mhudema@greenpeace.org and get it up on youtube. a. Bring blown up pictures of the tar sands with you and simply ask – why? b. 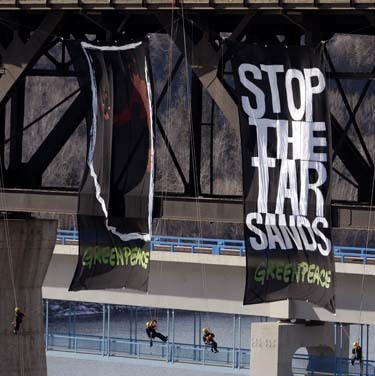 Bring a banner with a Stop The Tar Sands message on it. c. Stand-up and sing the US national anthem – that’s where all the oil and money is going anyway. d. Conduct your own ambush video (see below). Greenpeace has created a poster that you can put in your window to say that you support an end to the tar sands. Contact Mike at mhudema@greenpeace.org to get yours today. Before you go to the polls be sure you research each parties platforms and vote for the planet. Check out http://www.nonewapprovals.ca to find out what candidate has already signed on to the no new approval call out. Also check out http://www.pialberta.org/ to find out your candidates views on a variety of different issues. This is one of the easiest things you can do. If you see an article or hear a report that you want to speak out on, then do it! Did you know that the letters page is the most-read section of the newspaper? The press wants to hear your voice and so do the thousands of readers that go through a paper every day. Remember, while you can write to just your local paper, you can also submit your letters to bigger papers like the Edmonton Journal and the Calgary Herald, as well as national papers like the Globe and Mail and the National Post. 6. Join Greenpeace and become a Volunteer in the Fight to Stop the Tar Sands. Stopping the development of the tar sands means confronting the world’s richest corporations and a powerful government. Greenpeace exists because this fragile Earth deserves a voice. It needs solutions. It needs change. It needs action and with our new office in Alberta we are hoping to provide just that. We have lots of upcoming action and volunteer opportunities, ranging from staffing information tables, designing materials, and writing reports, to helping with direct action events. If you would like to join the effort please sign up to volunteer at http://www.greenpeacevolunteers.ca. The first step in breaking any addiction is to admit that you have a problem. With so many people in denial why not hold your own OAA meeting. It’s not that difficult a few chairs, some coffee and doughnuts and a public address system and your ready to go. A lot of politicians like to make grand statements about the climate to the public and then do exactly the opposite. Why not put those statements in perspective by holding your own green wash? Get a bunch of buckets of soap, some green food colouring, take it to your local target or forum and greenwash away. Why not join the other side? Become the only people that benefit from this development – the incredibly uber wealthy. Take on a fabulous name like Bill O’Naire or Annita Subsidy, dress to the nines (hopefully with a nice smoke stack top hat), dawn a british accent and cheer on those that destroy the planet. Contact mhudema@greenpeace.org for your full Billionaires for Tar action kit. Every two weeks we train people on a variety of skills that are needed to help stop this project, from non-violent direct action, to media, to puppet making. Please contact itstimetoriseup@gmail.com or join the face book group for updates and event details. ent, Rob Renner, to demand that the provincial government end this environmental nightmare by stopping all new approvals for tar sands projects. ust wanted to send a very brief update to everyone regarding ways to get information and get involved with the Stop the Tar Sands campaign. We have four facebook sites. * For people in Edmonton please join the Edmonton group at: http://www.facebook.com/group.php?gid=7938941961 Here you will get all the local event announcements, volunteer opportunities etc. Stopping the development of the tar sands means confronting the world’s richest corporations and a powerful government. Greenpeace exists because this fragile Earth deserves a voice. It needs solutions. It needs change. It needs action and with our new office in Alberta we are hoping to provide just that.We have lots of upcoming action and volunteer opportunities, ranging from staffing information tables, designing materials, and writing reports, to helping with direct action events. If you would like to join the effort please sign up to volunteer at www.greenpeacevolunteers.ca. We would always love to have more volunteers on the campaign and we have some great ways for people to get involved. * If you are interested in helping us poster, table at events, support other volunteers, outreach to diverse communities or organize keynote talks and movie screenings email our grassroots intern Jessie Schwarz at jessie_schwarz@hotmail.com.